Maddie wasn't sure if she liked the showhall at first, but now she is totally at home in front of the judges and admirers. She has gone head-to-head with her sister, Jann, at many shows, and they usually split the winnings. 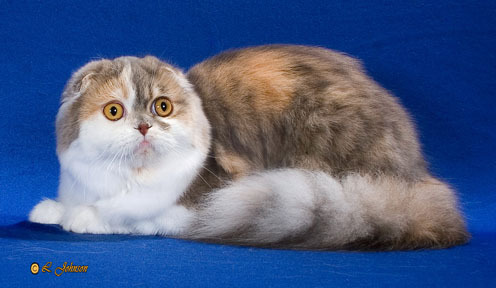 Her gorgeous splotches of colour match her eyes, and her solid body is exactly what a good Scottish Fold should be like. Maddie is now a Grand Champion. 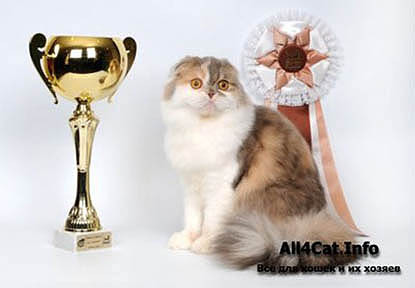 She was a one-show Grand at the Canusa Cat Show in Windsor, Ontario. 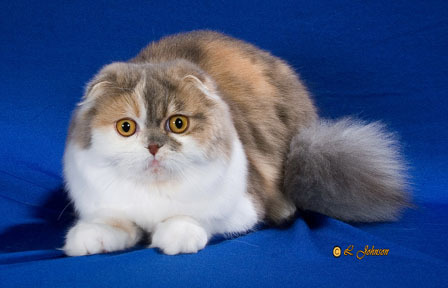 Maddie now lives in Russia at Rumfold Cattery, and is being shown in many shows there. We are very proud of you, Maddie!